Cities and counties from Portland, Maine, to Los Angeles have successfully passed local minimum-wage increases, but recent resistance in seemingly friendly territory suggests a momentum shift. The newly elected Baltimore mayor last month vetoed an increase of the local wage floor to $15 an hour by 2022, despite favoring the policy as a candidate. Earlier this year, the top elected official in Montgomery County, Md., outside Washington blocked a similar measure despite the county previously being at the forefront of local minimum-wage increases. Proponents view increases as a way to ensure low-wage workers earn incomes above the poverty line, and to narrow the disparity between rich and poor Americans. Opponents say raising the minimum wage discourages hiring and encourages employers to invest in automation or move jobs to lower-wage states or countries. The federal minimum wage of $7.25 an hour is set by Congress. It hasn’t increased since 2009. 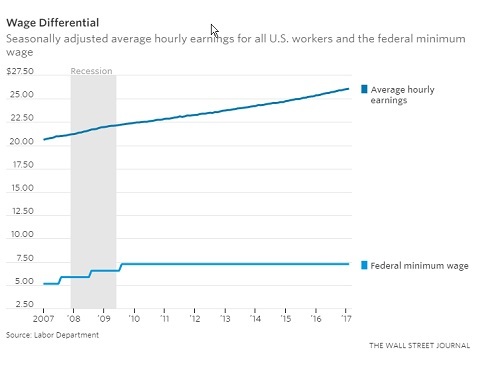 The average hourly wage of U.S. workers has increased by almost $4 an hour, or 18%, since the last federal increase, according to the Labor Department. Emily Bruno, founder of Silver Spring, Md.-based Denizens Brewing Co., said a minimum-wage increase would disproportionately hurt the local businesses that Montgomery County officials often tout, because small firms have less ability to absorb large cost increases than national chains do. An increase to $15 an hour would raise her labor costs by $300,000 a year, nearly equal to the brewery’s annual profit, she said. Lawmakers in several other states also are pushing back against local minimum-wage increases. At least four municipalities in Cook County, Ill., have opted out of the county government’s move to raise the minimum wage in the Chicago suburbs to $13 an hour by 2020. Iowa Gov. Terry Branstad, a Republican, approved legislation in March to roll back higher minimum wages already approved in four counties. In Flagstaff, Ariz., council members just amended a minimum-wage increase approved by voters in November to slow the pace of increases. Those rejections could reinvigorate business groups that have been pushing back on a national wave of minimum-wage increases that included California and New York establishing an eventual $15 level. Mike Whatley, director of state and local government affairs at the National Restaurant Association, said Democratic opposition to minimum-wage increases is helpful to groups like his. “It shows their peers around the country that they are willing to push pause and spend a little more time considering what it will mean for their community,” he said. Others say people shouldn’t read too much into a few losses. 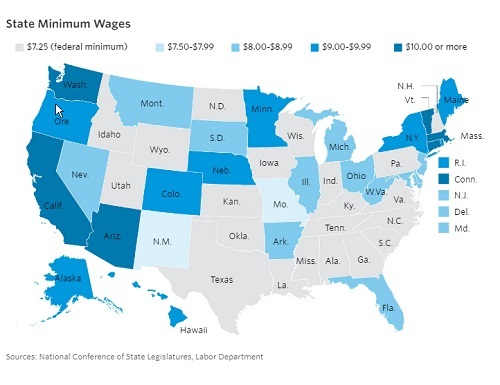 Last year, 18 cities and counties and seven states approved minimum-wage increases, according to the National Employment Law Project, an organization that advocates for low-wage workers. In Baltimore, supporters of the bill say the mayor broke her promise by rejecting legislation that the City Council approved in an 11-3 vote. Efforts by council members to override the veto came up short. 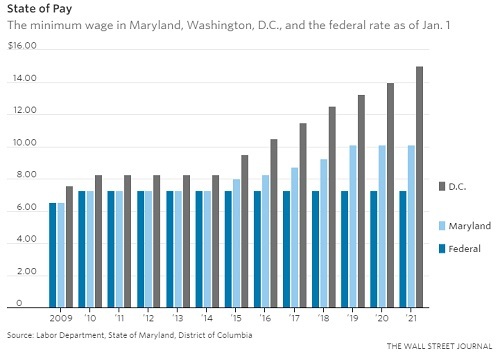 As a result, the city will continue to follow Maryland’s statewide minimum wage, which is set to rise to $9.25 in July and to $10.10 next year. The mayor said she worried the wage hike would drive private-sector jobs out of the city, where the 6.6% unemployment rate is far higher than in surrounding counties. In addition, city analysts estimated the bill would have raised municipal payroll costs by $115 million over four years, as the higher minimum wage was phased in. She said she reversed her position after hearing from some of the city’s employers. Four hospital systems, including Johns Hopkins, said the increase would have cost them tens of millions of dollars. Deli meat producer Dietz & Watson, which employs about 250 workers at a West Baltimore processing plant, threatened to move operations to Kentucky, Ms. Pugh said. The company didn’t respond to requests for comment. A local businessman, Ron Furman, who runs a craft candle-making business that hires people with employment barriers such as criminal records, told city officials that if the bill were enacted, he would open a planned factory in neighboring Baltimore County. “There’s a limit when you’re trying to compete with products made in Vietnam and China,” he said.